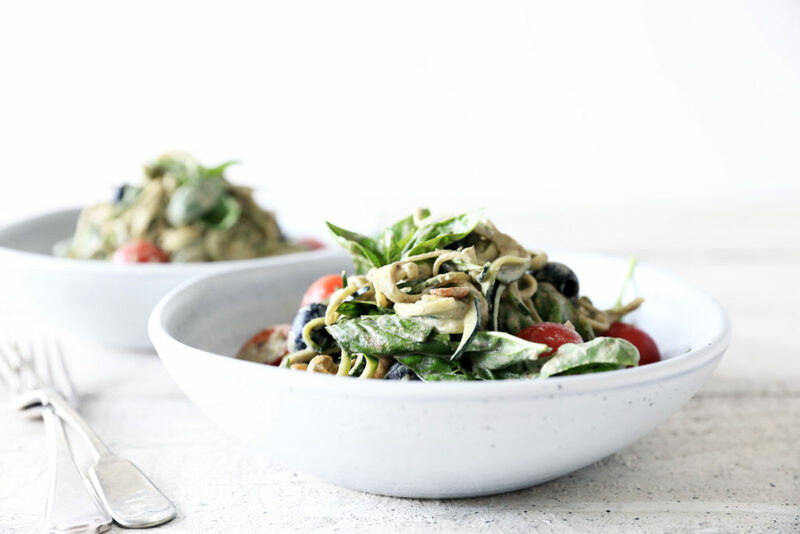 The inspiration for these raw basil zoodles with black olives, tomatoes and spicy cashews came from one of my local raw food cafes. This dish reminds me of a creamy Italian linguini, loaded with olives, tomatoes and basil, with hints of parmesan cheese. Not something I’d usually eat, but this version is completely dairy, gluten and sugar free, and being raw means it’s super charged with heaps of nutrients! What I especially love about this dish is, while it might look like it takes a lot of time and effort to make, that couldn’t be any further from the truth. The hardest part of the recipe is thinking ahead and putting the cashews and sunflower seeds on to soak for the sauce. Once they’re ready, it’s just a matter of throwing the rest of the sauce ingredients into the blender and whizzing it into a smooth basil sauce. To create the zoodles (zucchini noodles) you’ll need a spiralizer which you can pick up for around $20 on amazon. 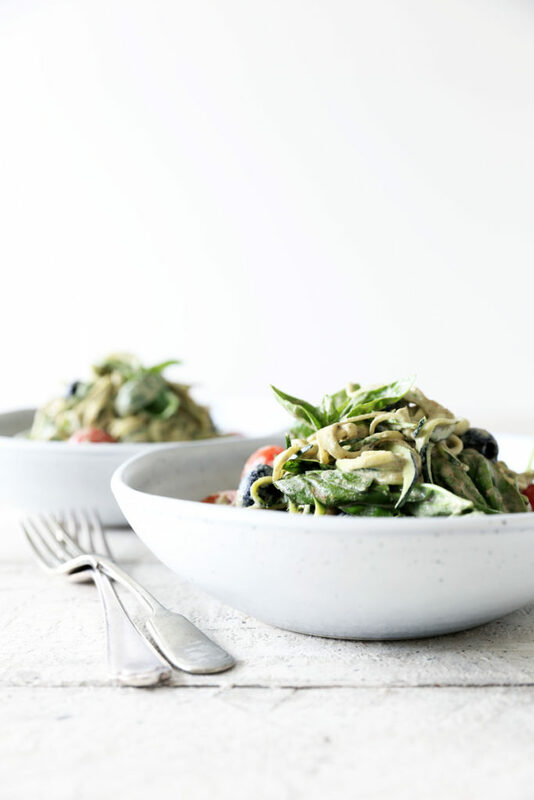 Alternatively, if a spiralizer is not something you can get your hands on, you could substitute for another type of plant based noodle such as black bean, adzuki or edamame. Cook them as per the packet instructions and then proceed with the recipe from there. 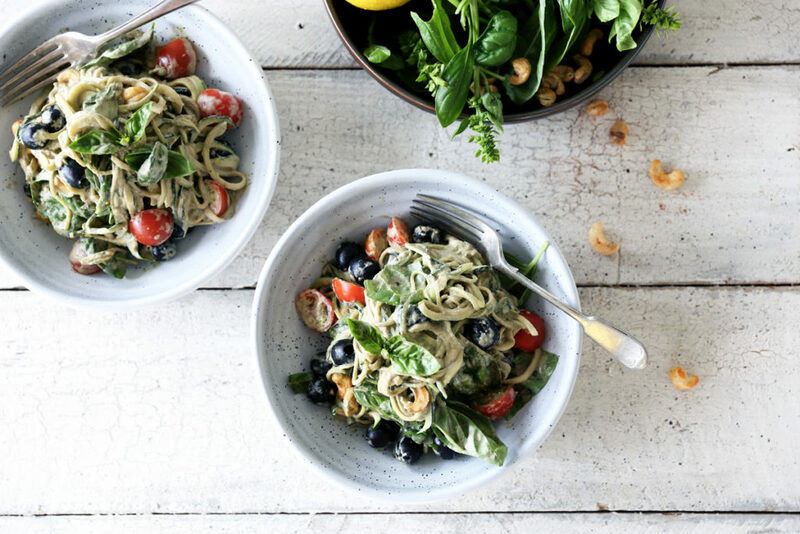 When you have your noodles ready, simply combine with the basil sauce, tomatoes, olives and cashews… and you’re done! Zucchini’s are full of nutrients, very low in calories and very filling, especially when eaten raw. So this dish will satisfy even the hungriest raw food sceptic! If the idea of a completely raw meal sends shivers down your spine (maybe you’re in the depths of winter…) then you can also gently heat this dish and serve warm for an equally delicious meal. 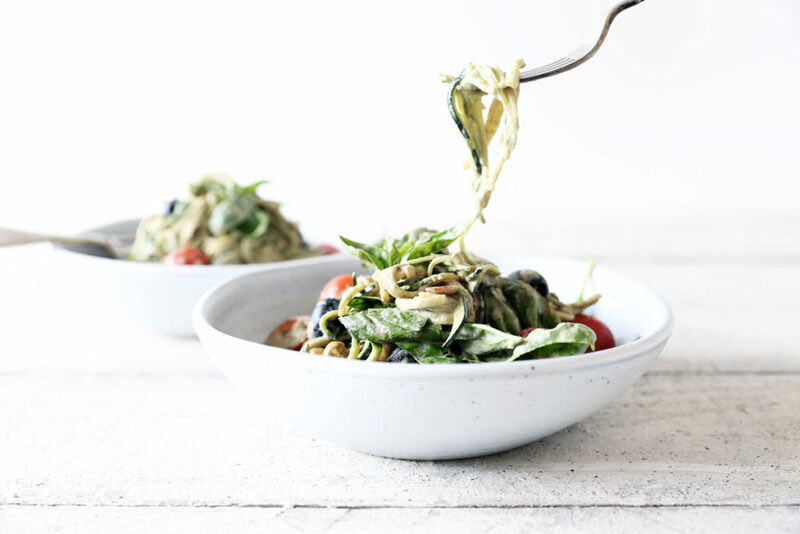 These basil zoodles are great for lunch or dinner, make a an ideal packed lunch and will last in the fridge for up to 2 days. Hope you give this one a try and let me know what you think in the comments below! Enjoy! Prep ahead by soaking the cashews and sunflowers seeds by placing them in a bowl and cover with filtered water. Leave to stand for 4 hours, drain and rinse well. Place them in a high speed blender or good food processor along with the rest of the sauce ingredients and blend until smooth. Taste for flavour and if necessary add a little more lemon juice or salt according to preference. To make the spicy cashews, preheat the oven to 160ºC. Place the cashews on a lined baking tray and sprinkle with spices. Place try in the centre of the oven and roast until just lightly browned, approximately 10 minutes. Remove from oven and allow to cool. To make the zucchini noodles use a spiralizer to turn them into zoodles. Place them in a large bowl and combine with the basil sauce. If the zoodles are really long you may want to cut them with scissors so they’re easier to eat. Add the cherry tomatoes, olives and cashews to the bowl and stir to combine. Serve piled high on serving plates with some freshly ground pepper and a sprig of basil. The basil zoodles will keep fresh in the fridge for up to 2 days.